Posted April 8, 2019 by Town Hall Terrace & filed under Grand Island. It’s been a little more than a year since the old toll booths on the Grand Island bridges were replaced with a new cashless tolling system. When the new system launched, many residents and local officials were optimistic that it would reduce traffic congestion on the bridges and save drivers valuable time during their morning and afternoon commutes. In practice, however, the cashless tolling system has been plagued with issues that caused some drivers to be wrongly charged hundreds of dollars in late fees. 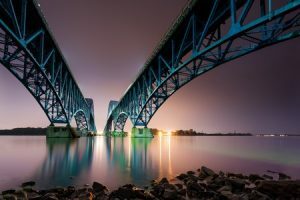 Now, in an effort to resolve these problems once and for all, two state senators are sponsoring legislation that would remove tolls from the Grand Island bridges altogether. New York State Senators Chris Jacobs and Rob Ortt argue that the tolls, which were originally instituted to help pay for the cost of the bridges, have outlived their usefulness and should therefore be eliminated. “What we see is that those bridges generate about $20 million a year in revenue and clearly it’s not $20 million a year to upkeep those bridges. Most of that money is heading downstate to support other things,” said Senator Jacobs in a recent interview. Although past attempts from Senator Jacobs to eliminate the tolls have failed to receive approval from his fellow lawmakers, he says he now has more support in the wake of the cashless tolling debacle. There is a currently a companion bill that calls for the removal of the tolls pending in the State Assembly as well.